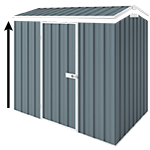 This EasyShed Garage Shed is the second largest model in the range. It spans nearly 8 meters long, which is big enough to provide ample storage and a workshop! You can now add one of these beauty’s to your home to not only solve your storage problems but to add value to your property. This Zinc model is long but narrow and can also be transformed into an ideal workshop. Garage sheds are flat packed for delivery but everything you need to assemble it, is provided. You will be supplied with the easy DIY instruction manual. Choose from a variety of accessories available on this page to customise and upgrade your product. We recommend you consider adding them now to help save time and money. Some shelves, windows and locks can improve organisation and usability. Garage Sheds come with 20 years warranty. Please check and order Anchoring sets for your product to ensure you secure your shed at assembly. NOTE: The image is for illustrative purposes only, chosen dimensions will reflect in the end product.